Duration of the cruise: about 1 hour 10 minutes. Boarding and landing: Port de la Conférence – Pont de l’Alma, on the Rive Droite in the 8th arrondissement in Paris. For more than 50 years, the Compagnie des Bateaux Mouches has told a love story to generations of passengers, those who are curious, poets, those who are romantic or in love… The sightseing cruises Ther crew is waiting for you on board one of 9 boats enclosed in glass and bathed in light to cast off and accompany you on a journey through time. Daily departures throughout the day and in the evening. 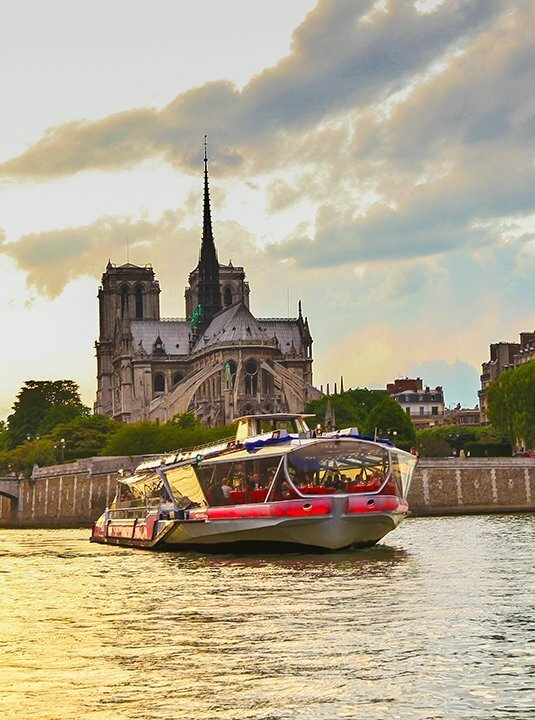 The lunch and dinner cruises The 5 boat restaurants of the Compagnie des Bateaux-Mouches® travel all over Paris every day to reveal the heart of the City of Light. They will allow you to discover or rediscover all of the magic of the banks of the River Seine, which are enhanced, in no predictable order, by the most prestigious monuments which have marked history.